For the past several years, much like many of you, the fastest Internet speeds I have enjoyed have been at home. Very often, corporate networks, be they those at headquarters or client sites or shared networks at events and public settings, lag well behind my own home experience. For me, considering my devotion to being always-on, fast Internet is practically as important, if not more so, than good food or other more traditional human comforts, and any interruption of said flow is personally trying. That would explain why when moving the family to our new house last Friday, getting access to high speed Internet again as soon as possible was a major priority, and finding a stopgap for the interim was just as critical. Luckily, Comcast took care of us Wednesday, bringing fast WiFi to our new home at great speeds, and for the five days previous, the HTC Evo did the very best it could, making the extra $30 a month I pay for its Hotspot capability, powered by Sprint, worth every penny. In contrast to AT&T's sloth when it has come to empowering tethering and letting my previous smartphone reach its full potential, Sprint has been leading the charge in letting phones be as much about data as they are about voice. In the same month that AT&T eliminated their unlimited data plan and set their highest end plan at 2 GB, I not only flew past that point, but 3 GB as well. 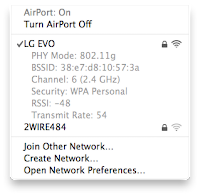 This is because, as I mentioned at the end of last month, I am using the wireless hotspot often - at client sites, at cafes, restaurants, shopping centers, and yes, in the last week, as the sole provider for Internet at our home. It might not have been the fastest Web ever, but it sure got the basics going. If you have experienced full-speed always on Internet, only to have that taken away for a longer period, the available narrowband becomes much like a triage situation. YouTube viewing has to go away (much to my own kids' consternation and much iPad banging). Streaming music services (like Spotify) are a non-starter. Downloading movies or apps from iTunes was a pipe dream, and as great as the Hotspot is, only two computers can share at one time, so we found ourselves disabling one iPad to let another device - be it laptop or tablet - onto the Web. Survival of the fittest. Sprint reported more than 3 GB pulled down on the Evo in June. As someone who refuses to be out of the loop on information, despite such data hurdles, I found myself making time to get the most critical data and skipping out on more frivolous activities. I still powered through Google Reader, gnashing my teeth at photo-laden entries, and browsed Twitter mostly by phone, but activity on social networks was reduced - especially on Google Buzz, where the prospect of waiting for Gmail to load before getting to the network itself was too much to consider. The good news is that Comcast not only turned on our Web access Wednesday, but the speeds are fantastic. After about 5 days of strained narrowband, we were more than happy to turn over our iPads to the twins and have them back to surfing YouTube - and it only took seconds for me to pull down the 40+ megabyte download for Safari 5.01 yesterday. In fact, SpeedTest.net shows 20 Mbps around the clock, so our broadband is back and kicking. I'm glad we have the HTC Evo ready for a backup, but it's not going to replace the full-speed stream any time soon. I love my broadband.